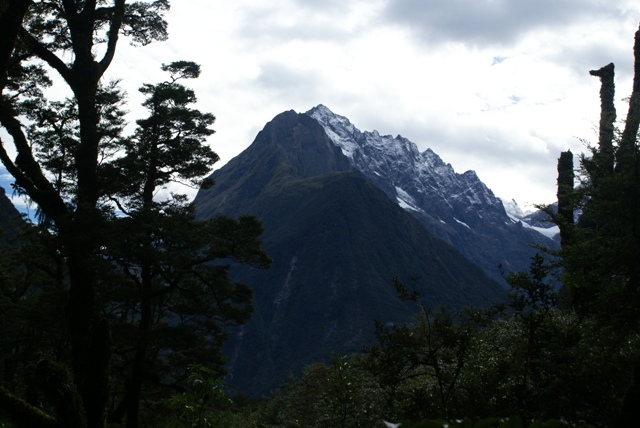 On Sunday the weather was better, but overcast as we started the 2 hour, 75 mile drive to the very small settlement at the head of Milford Sound. 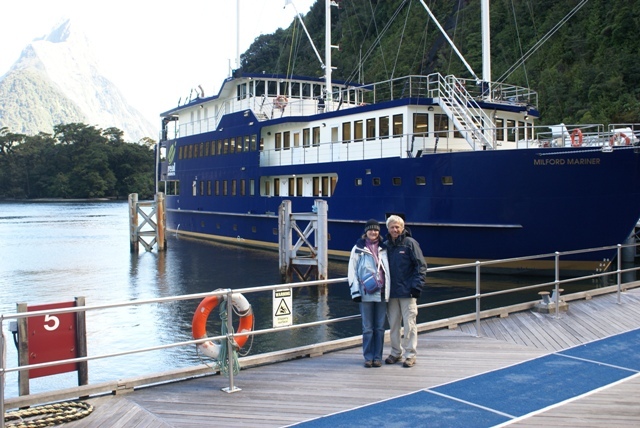 Here we would board the boat to cruise down the 10-mile long fiord to the sea and back. The drive itself has to be one of the most scenic in NZ and has World Heritage Highway status for it's beauty and scenic variety. About half way along it the clouds cleared and the sun came out. It stayed that way for the whole day and the trip was just fantastic. It's all so big! 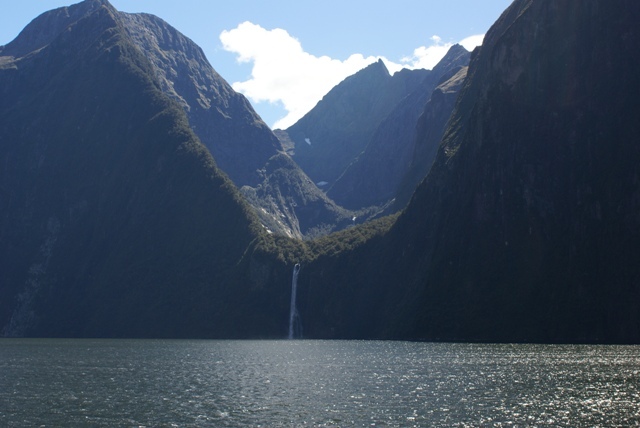 Judging the scale of things in this grand scenery is very difficult, with what looked like a small waterfall pouring into the fiord from a mountain valley, turning out to be 3 times the height of Niagara Falls! 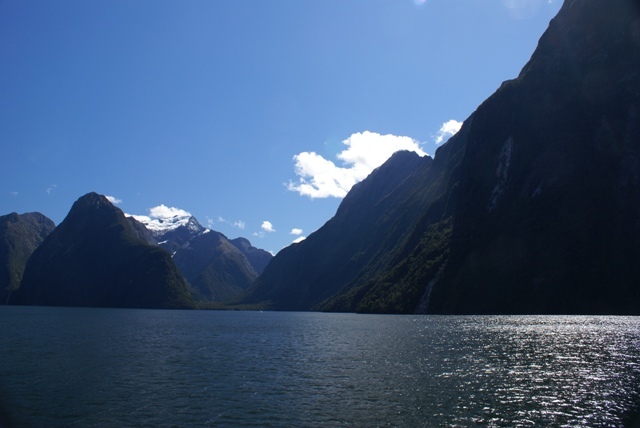 The boat was not small, having 30 or so cabins for overnight cruises, but it only had a small number of people on board which complimented the remoteness of the Sound and made the 3 hour cruise even better. 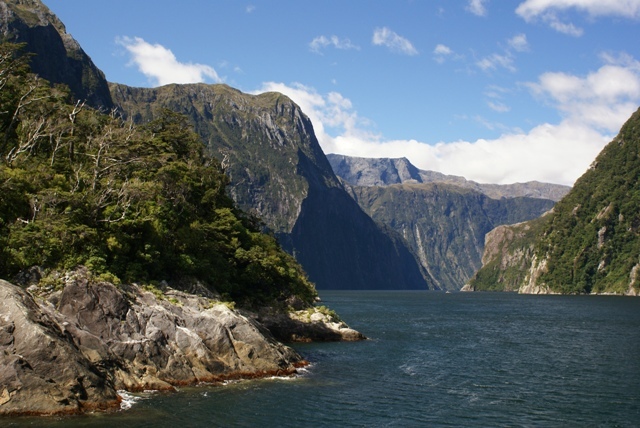 The Sound is lined with spectacular cliffs and peaks rising straight up from the water and cascading waterfalls plummeting down from suspended valleys. 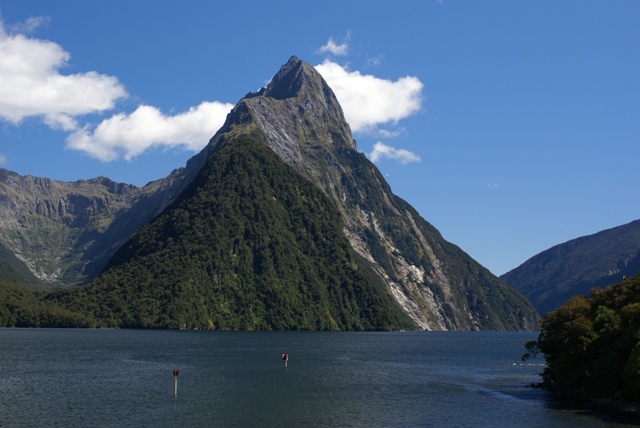 Rock walls rise vertically from the water to a height of around 4,000ft and the surrounding mountains rise to around 9,000ft. It's all very dramatic. 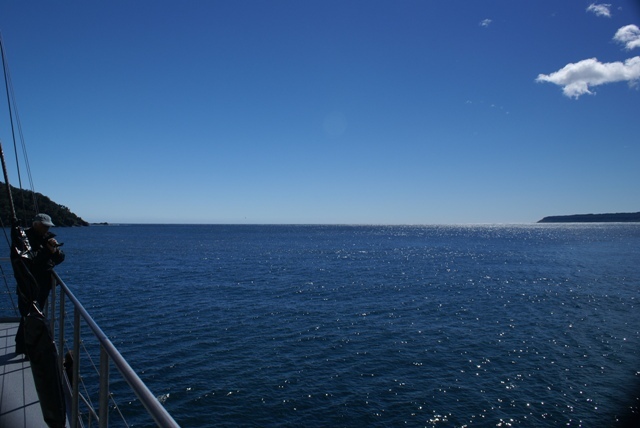 There had been little wind all day and on reaching the Tasman Sea it was calm - this so rarely happens. 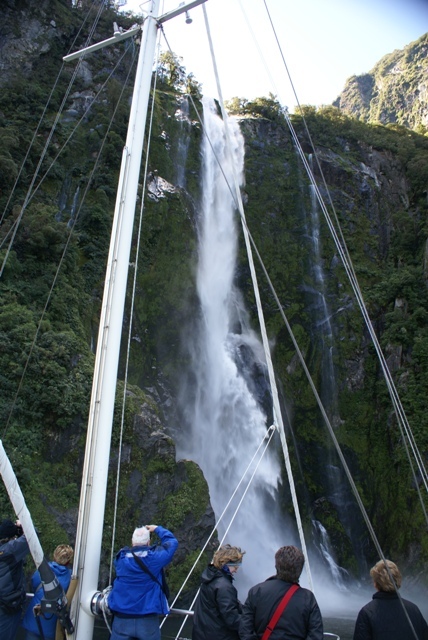 The vertical sides of the Sound go straight down under the water and on the return trip the boat almost touched the sides as its bows disappeared under one of the cascading waterfalls, to give us all a real close-up look. 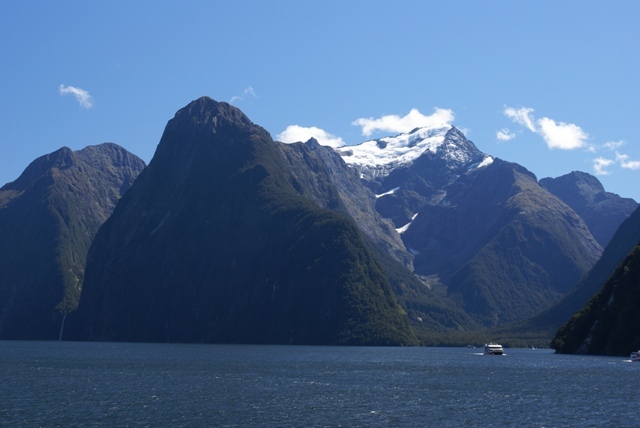 As we headed back up the Sound, the sun shone on the snow-capped mountains at the head of the Sound giving another million dollar view. Once back on land there was more time on the return drive to explore. So it was off to an alpine nature trail at the Homer Tunnel where we had a close encounter with a couple of Keas (the mountain parrot) - one sitting on the car! The tunnel is about 3/4 mile long and cut through solid rock. It's mostly single lane with passing places and there's no tunnel liner inside, just bare rough rock. It took 19 years to complete. Then on to the cascading river at Marian Lake and another swingbridge. The Mirror Lakes were the final stop before arriving back at Te Anau. With such good weather it had been another very special day. We were so lucky. 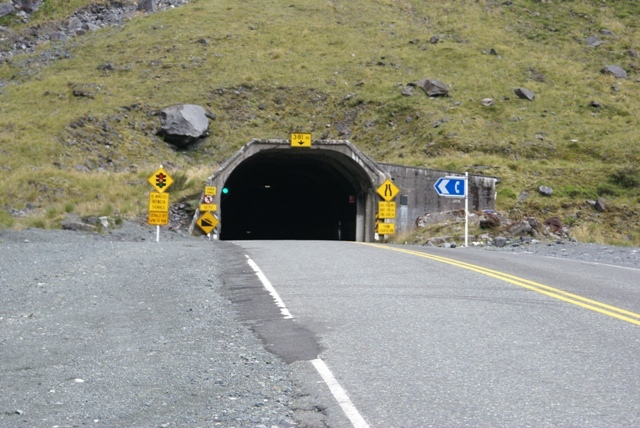 The entrance to the Homer Tunnel, on the way to Milford Sound. 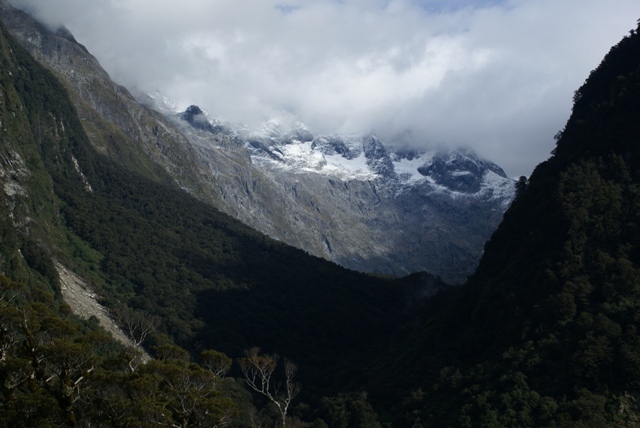 Above and below, looking up at the mountains as we approach Milford Sound. 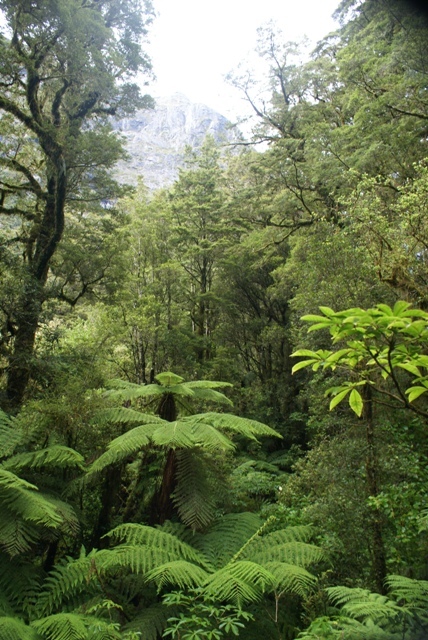 Looking down at the dense temperate rainforest. Milford Mariner, the boat we went on. Note the coats, hat and gloves - it was a lovely sunny day, but still quite chilly. 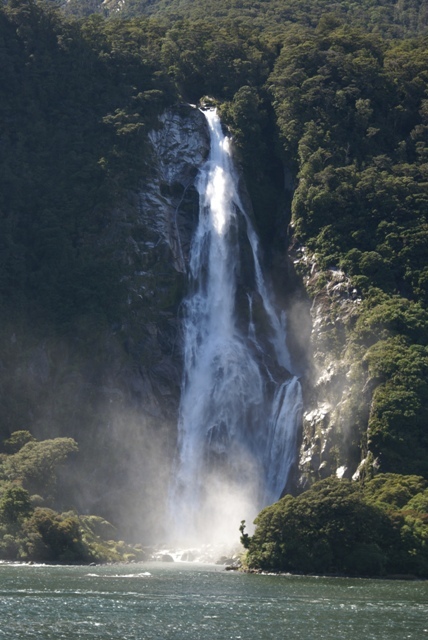 One of the early waterfalls, Bowen Falls, drops 530ft into the Sound. To appreciate the grand scale it helps to have quite a big tour boat in the picture! 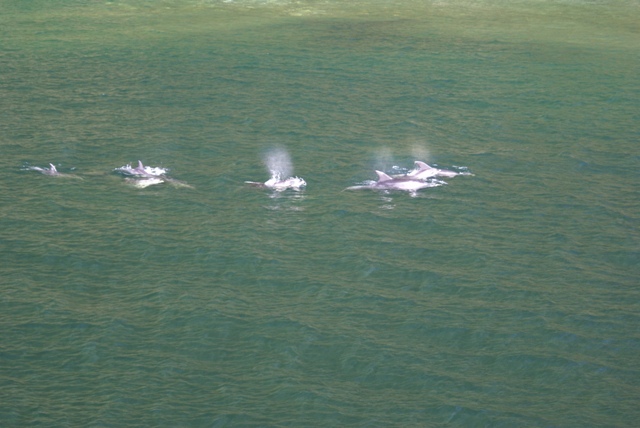 Bottlenose dolphins put on a display. Scale again - this is the waterfall, Stirling Falls, that's 3 times the height of Niagara Falls! Looking back, from where we've come. Looking forward, to the Tasman Sea. entrance can't easily be seen - Captain Cook missed it. Getting closer to another waterfall.